Lots of links to pick from, some of them are awesome but most of the options are kind of spammed or low quality. You can see the domains and you can check everything before placing links but separating the good domains from spammed domains was kind of hard and I struggled with that. Metrics promised in the search indexes matched actual metrics of the sites which was nice and as I said there are some great domains to get links from. Ok seems great. Can I submit my own article to whoever owns that domain? I will love to try your service. I registered with link management 6 months ago but never placed any order till i see this thread. I bought 2 links from links management website, both website are niche relevant. I am super impressed with one website which is exactly related to my niche. Avg tf is 25 with clean history which is quite good i think and i paid $49 for 2 links which is lifetime. Let see how long they take to place my link on both website, i am super excited. Thanks for feedback! Please check your pm, we are waiting for your answer! Received $25 bonus. Thanks Linksmanagement team, will definitely order more soon. I bought 4 links from your website already, the choice of niches is impressive, interface is simple and easy-to-use, though it took me some time to find what I need at the first time. Thank you for custom filters! The service is very good. Bonus is on your account already, check it! btw, can I withdraw the money from account? How long it takes (avg) to place links ? Thanks for the interest in our services! This comment is dated 2015 and since that time we improved our system sufficiently and obtained many backlinks of better quality. Currently there are more than 8,000,000 backlink pages in our inventory! We have implemented preapproved payments to keep your campaign running and for your monthly links stay live. Please note that a PayPal Express Checkout Billing Agreement is created automatically whenever funds are added to your balance. In this case, you should cancel a PayPal Express Checkout Billing Agreement every time once the payment is made to avoid automatic charges. So if you don't want to be charged automatically, you can refill your balance manually. According to our refund policy we make refunds on the first client's demand. Follow this link and you will learn the cases when refund is made and link placement time. That's great. I will topup my account with $100 at Monday and will try your service. Hope my links will be placed, because week ago I have triedtextlinksforsale(com) and I still don't have my links placed. Awesome! Remember that if you leave your feedback in this thread you will also get bonus $25 for backlinks. Waiting for your feedback! We'll gladly answer all your questions if any arise. Please send me 3 examples from high pa/da links and confirm this are not sape links. Hello! Thank you for your interest! We sent you pm with backlinks examples. LinksManagement offers quality manual link building services. 5) What if a link is not placed? 7) Do you send review copies? Yes, we do, but their quantity is limited. 9) What bonuses do you offer now? We offer $25 for backlink purchase. Buy at least one backlink in our inventory, leave your feedback about our service in this thread, and get bonus. 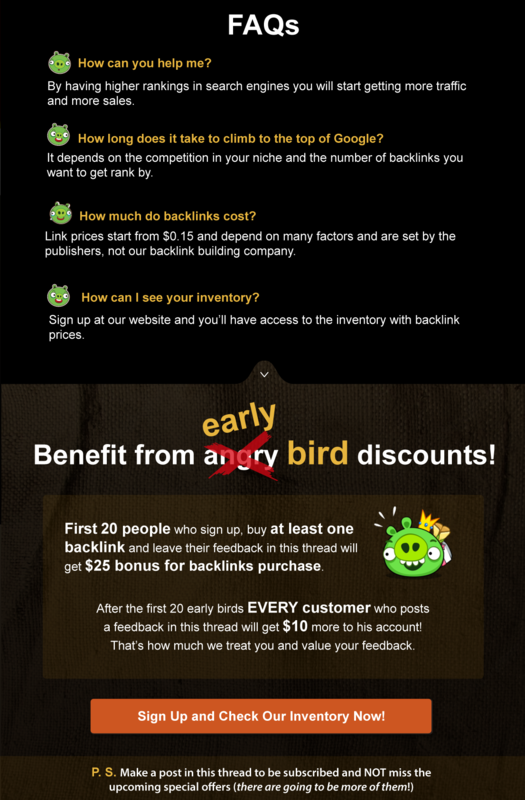 You can spend $25 bonus on backlink purchase. Having more questions? We are ready to answer them. it took me too much time to filter the good domains, can you remove all subdomains of eu.org? those are the most annoying listings, and there are thousands of them, if you remove all eu.org subdomains, you will make it easier for us to choose the good domains.